In a bowl big enough for tossing, toss the shrimp with the lime juice. Mix the garlic powder, onion powder, thyme, salt, red and black peppers together. Sprinkle mixture over the shrimp then toss to coat well. Spray a large skillet with nonstick cooking spray and heat until hot. Add the shrimp and cook, stirring constantly, for about 3 minutes until the shrimp are pink. 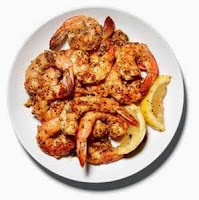 Using a large spoon, remove the shrimp to a serving platter. Cover and chill for at least an hour. To serve, garnish platter with lime or lemon wedges.